Blue Widow female Seeds produce a cannabis plant with Photoperiod genetics and a flowering time of 7-8 Weeks. Blue Widow female Seeds has a genetic makeup of Blueberry x White Widow and would make an excellent addition to anyones seed collection. 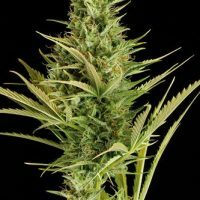 Buy Dinafem Blue Widow female Seeds at the lowest price online now! Blue Widow is an F1 hybrid of Blueberry and White Widow that was created to give flavour, taste and colour. The intense sweet & sour taste of White Widow and the forest berry aroma of Blueberry, when mixed, create a blend of fruity sweets that smells like chewing gum. Due to its Blueberry heritage, in low outdoor temperatures this plant displays autumnal colours, turning from blue to purple and even reddish colours when the temperature drops even further. It also grows somewhat taller than pure White Widow, displaying larger internodal distance as well. It has great upward growth and can double in size as it starts flowering making it good for a SCROG set up. 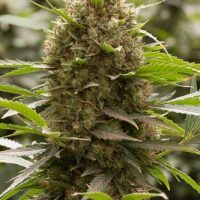 Outdoors it can reach 3m tall which, along with good dry weight production, the precocity of the blue mother and the resin production and sedative power of the White Widow father, guarantees high production. It is a good producer of fat purple buds totally coated with trichomes, with a fruit chewing gum taste and a nice strength. It shows good mould resistance but particular care is recommended during the last two weeks of flowering, because the size of the buds increases significantly which can lead to the appearance of mould.